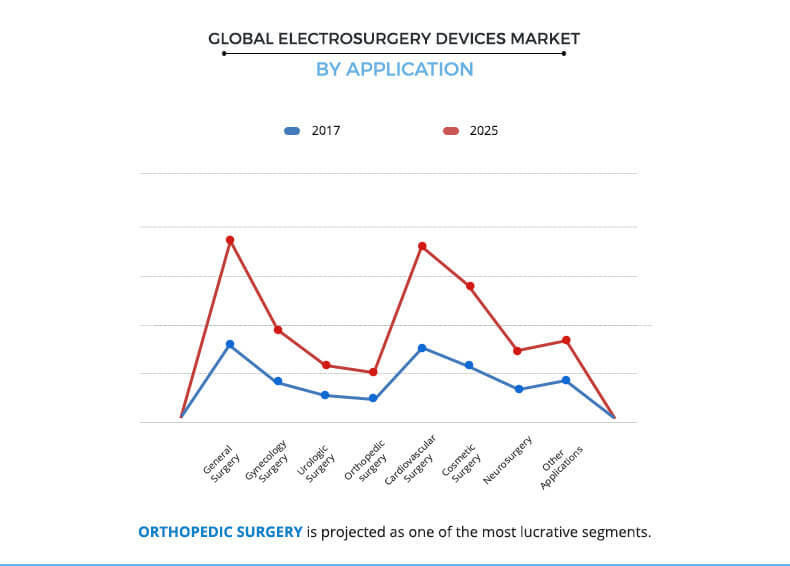 The global electrosurgery devices market was valued at $2,591 million in 2017 and is projected to reach $3,784 million at a CAGR of 4.8% from 2018 to 2025. Electrosurgery devices are used in surgical procedures such as cardiovascular surgery, gynecology surgery, general surgery, and others. These devices apply electric current for the thermal destruction of the targeted tissues. Electrosurgery devices are employed in surgical procedures to cut, coagulate, desiccate, and fulgurate the tissues. These devices are used in conjunction with specialized instruments. 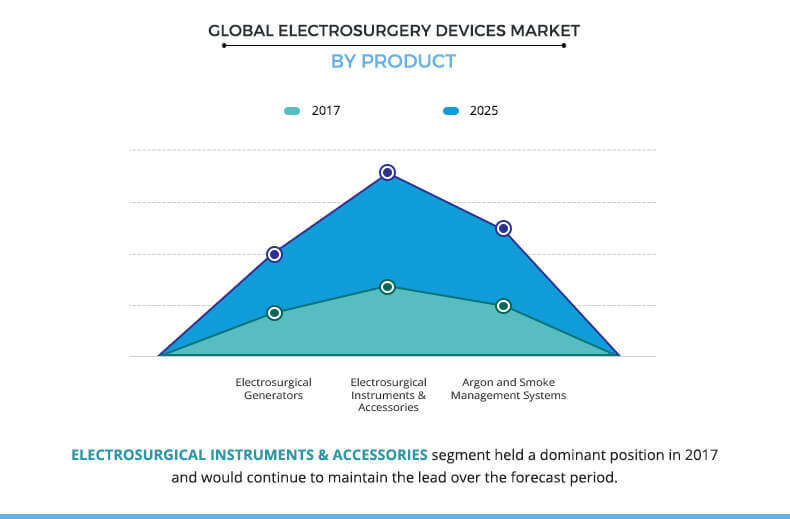 The growth of the electrosurgery devices market is driven by rise in number of surgical procedures globally, large pool of geriatric population, increase in prevalence of chronic diseases, and technological advancements. However, stringent government regulations for product approval are expected to hamper the market growth. Conversely, high market potential in untapped emerging economies is expected to provide lucrative growth opportunities for the market. The global electrosurgery devices market is segmented based on product, application, and geography. Based on product, the market is categorized into electrosurgery generators, electrosurgery instruments & accessories, and argon & smoke management systems. The electrosurgery instruments & accessories segment is further bifurcated into electrosurgery equipment (bipolar electrosurgery instruments and monopolar electrosurgery instruments) and electrosurgery accessories (patient return electrodes, cords, cables, and adapters, and others). 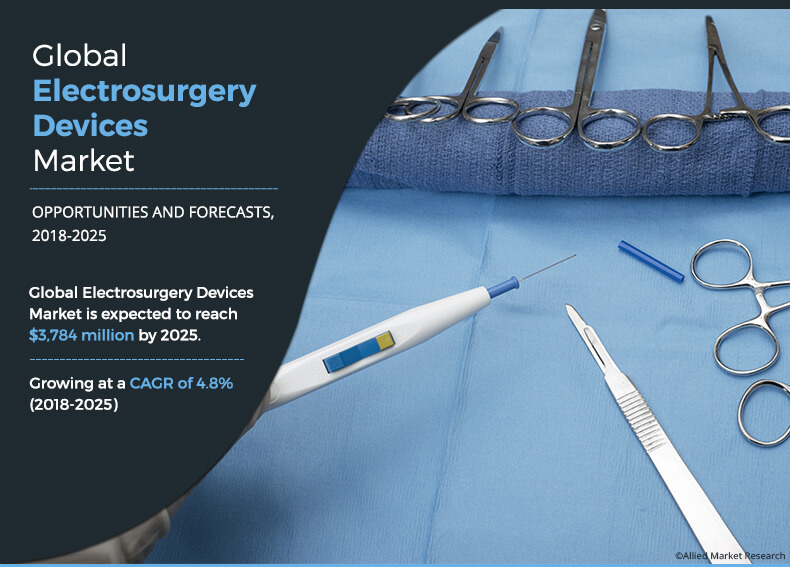 Electrosurgical instruments & accessories accounted for the largest market share in 2017 and is anticipated to grow at a significant CAGR of 5.6% during the forecast period. Based on application, the study includes general surgery, gynecology surgery, urologic surgery, orthopedic surgery, cardiovascular surgery, cosmetic surgery, neurosurgery, and others. General Surgery segment accounted for the largest market share in 2017. On the other hand, orthopedic surgery is anticipated to grow at a significant CAGR of 5.9% during the forecast period. Based on region, the global market is studied across North America (U.S., Canada, and Mexico), Europe (Germany, France, the UK, and rest of Europe), Asia-Pacific (Japan, China, India, and rest of Asia-Pacific), and LAMEA (Latin America, Middle East, and Africa). North America accounted for the highest market share in 2017, followed by Europe. On the other hand, Asia-Pacific is anticipated to dominate the market during the analysis period, owing to high geriatric population base, increase in disposable incomes, and rise in awareness about various cancers in patients. Moreover, Asia is a large continent, and has emerged as an epicenter of chronic disorders. The key players of this market include B. Braun Melsungen AG, Boston Scientific Corporation, Bovie Medical Corporation, BOWA-electronic GmbH & Co. KG, CONMED Corporation, Erbe Elektromedizin GmbH, Johnson & Johnson (Ethicon US, LLC. ), Medtronic Plc., Olympus Corporation, and Smith & Nephew Plc. Other players (these players are not profiled in the report and the same can be included on request) in the value chain include Megadyne Medical Products Inc., KLS Martin Group, and Utah Medical Products, Inc.
Factors that are instrumental in changing the market scenario, rise in opportunities, and identification of key companies that can influence this market on a global & regional scale are provided. Surge in number of surgical procedures across the globe is the major factor driving the growth of the global market. Relevant factors, such as large pool of geriatric population and the consequent rise in chronic diseases along with the technological advancements also contribute toward the growth of this market. However, factors such as stringent rules & regulations for product approval hamper the growth of this market. Conversely, rise in various growth opportunities in the emerging economies is expected to open new avenues during the forecast period. 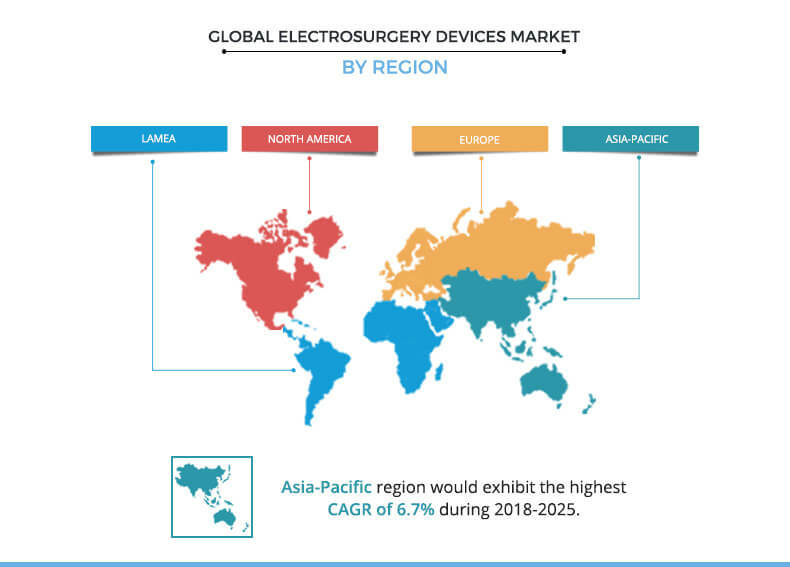 The use of electrosurgery devices is the highest in North America, owing to rise in number of surgical procedures in the region, followed by Europe and Asia-Pacific. In addition, rise in geriatric population is anticipated to drive the market growth.